The Dragon Ball series is one of the most wonderful pieces of Work in the modern era. It is still as yet unknown if the author was, or is, aware of the scale with which this Work covers. Though my guess is, he is indeed aware. You may be asking yourself why the use of a capitol “W” when referring to Dragon Ball. The answer is simple. Any Work that conveys the Great Work, as it is called in western alchemy, also known as the Tao (or Dao) in the east, deserves this distinction. Dragon Ball, including Z and GT, however, go far beyond showing the viewer the initiatory stages of the Great Work. This article is by no means a full explanation of the symbolism and allegory within the Dragon Ball series. What will be covered here, will be brief, and if you are unfamiliar with the series, there is no doubt you will have many questions. There is so much within Dragon Ball, that to begin to write a full length book on the subject is a momentous undertaking. Huge credit goes out to Derek for doing this Work, and releasing his primer book “It's Over 9000! When Worldviews Collide”. Today we will be discussing the Dragon Ball universe and how it relates to our current reality. The angle of approach will be wide, and many details will be left out, both due to time constraints and to get you thinking, and asking questions, to prompt your own Path of discovery. With that said, we will begin with the hierarchy of the Dragon Ball universe and how it relates to levels of consciousness. With this foundation we will move into Goku's Path of Enlightenment and Transformation, which has multiple stages, finally culminating with the Earth's own Transformation. Stick with me here, this will be one heck of a ride! What is shown and described within this article is my own interpretation of Dragon Ball, and the many other subjects I have looked into. By no means take my words as truth. Look for yourself, find your own Path, follow your own intuition. You know the feeling I am talking about. The chills down your back, pay attention to those moments; what is the subject, what is being said, how it is being said and how did you felt about it. If you felt uplifted, excited, happy, joyful, loved; any uplifting feeling, don't let it slide by unnoticed. Some of the subjects and processes discussed here have to do with internal energy work and, what can be considered altered states of consciousness. By that I mean, not your “every day” experiences. I beg of you not to take these things lightly. If you attempt these methods alone, the risks are high; physical sickness, mental sickness and/or spiritual sickness could occur. Death is even a possiblity. These things can happen without your awareness. So it is imperative to learn slowly, mindfully and not let your ego control your thoughts or actions. If you would like to begin self-cultivation, I suggest finding a school where you can learn Tai Chi, Qigong and meditation. Yoga can be another option, but as with any school, you must first make sure the teacher is right for you. There are a lot of “Mc. Dojo's” out there, both in the martial arts, yoga and spiritual communities. Stay alert always, and remember, All There Is, Is Lessons. I started out typing a lengthy explanation, but, reading is not my cup of tea, let alone writing a bunch of mess. So, lets stick with pictures as much as possible! But before we get into pictures, a very important point needs to be made. In the universe, there is duality. Yin and yang, white and black, good and bad, Service To Others (STO) and Service To Self (STS). It is in the STO and STS realm which we will be working for much of this discussion. Why you ask? Because this is the primary choice which determines where a Being is, or is going, in the universe, as it relates to the evolution of consciousness. However, while this is a choice, the Reality is, weather you are STO or STS, ultimately, you are serving the Source and learning in which ever Path you choose. There is no "right" or "wrong", there is only Freewill. You might be wondering how the heck all this ties together. Well, this is what the image below attempts to do. I did not address Hell or Demon land in this because they are not the point of this article, however, most mythologies seem to suggest the layout shown in DB is somewhat accurate. 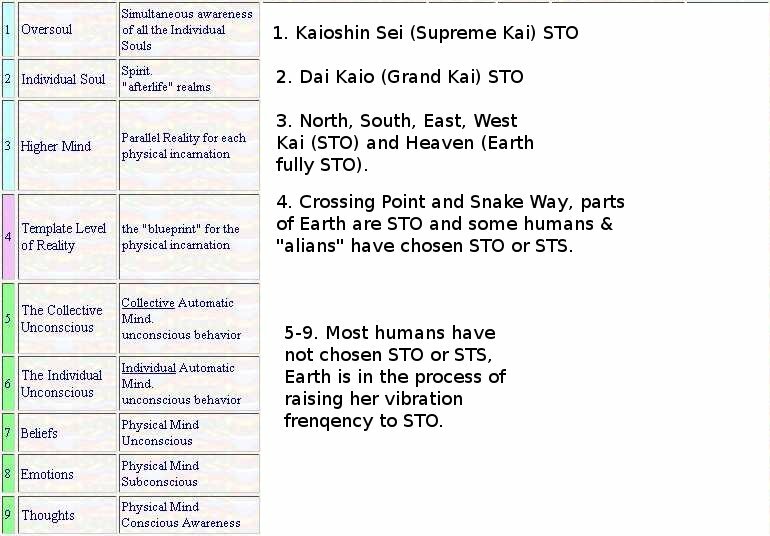 I will say this, both Hell and Demon land are, more than likely, places were the beings are so lost from the Source (STO; Unconditional Love, Acceptance and Forgiveness), in a STS (dog eat dog, greedy, thieving, murdering, lying) environment, that their energetic vibration is becoming lower and lower. This, I believe, is why it is nearly always referred to as the Abyss. You all know Goku's genetics: He's a Saiyan and they love to fight, destroy and conquer. Before hitting his head as a child, Goku embodied his genetic heritage, or you can say, his consciousness to that moment in his evolution. Once he fell and hit his head, that physical injury altered his brain, removing those inherited traits from his beliefs, emotions and thoughts; affectively removing his base ego. Thus he was given the name Goku, or empty mind, which is the perfect type of mind according to Taoism. The framework grandpa Gohan built in this empty mind was kindness and compassion towards others, with a splash of the Way of the Warrior. Master Roshi trained Goku's body and mind even more along these lines. Now we come to Master Korin, the cat, which cat's are said to be able to see the astral plain, or energetic plain, with more ease than humans and other animals. Note: This photo came from a post on tantra yoga, however I do not suggest that route for spiritual cultivation. It too easily leads one astray into attachment. I will say, from personal experience, sexual union can be gained; this is where both parties are open to one another, and giving unconditionally to one another, without trying to control the situation. The result of this can be the opening of the 4th chakra, or the heart chakra. But like I said, you can become attached to this activity and become stuck. I chose this image because it also shows which element is associated with the lower chakras. It is the lower 3 chakras that nearly everyone operates on, unconsciously. Here you can see the 7 chakra's that reside inside the body. There is an 8th chakra just above the head, still within our luminous body, and a 9th chakra above that, just outside the luminous body. All 9 chakras are connected via a tiny thread. Below is a description of each chakra from the Andean Shamanic tradition. Of all the traditions that speak of the chakras, this is the one I have come to view as the most complete, and with the least amount of distortions, as it relates to our luminous bodies; which is of the utmost importance. 8. Radiant Sun, Soul washes us in it's rays, can create a new body, expands like a golden egg, personal experience with God, how we experience Him. Goku finds his way to Korin tower because of the 4star ball. Now, as in all of DB, nearly everything has a symbolic meaning. The dragon balls are no different. There are 7 of them, and each ball represents one of the 7 chakra's within the human body. Because of Goku's mindset: non-ego driven, with a good belief, emotional and thought foundation, he is only searching for the 4star ball because it reminds him of his loving grandpa Gohan, and cares not for the others. The 4star ball represents Love, more specifically, unconditional love towards yourself and others, or Service To Others. As you might remember, Korin tower is located in the west, is white, and very tall, with carvings of geometry, animals and Indian looking faces on it. Bora, Upa's father, tells Goku, the only way to get to the top and train with Korin, is to use your own strength. Technology is of no use in this pursuit, and as we find out, the only other person to make it to the top before Goku, was Master Roshi. What does Goku learn on this first visit with Master Korin? He learns of his conscious past, present and future by looking into water. Water is nearly always a reference to the Tao, or the ability to flow along the path of least resistance. He learns how to control his Breath and read the movements of others by their Breath. Breath here is not just air, it is chi, or ki, or life force. Once mastered, he is able to drink the Sacred Water. This is the first step in the self-cultivation practice of internal alchemy. On Goku's second trip to see Master Korin, he asks for more training. After Korin sees Goku is not afraid of death, he says, “well if he's not afraid of death, I guess he can take a sip.” This is in reference to the Ultra Divine Water. Korin tells Goku that the Ultra Divine Water is not like the Sacred Water, which is for amateurs, but it is the Real stuff. Basically, Korin is saying that if Goku accepts the challenge, he will be surpassing Master Roshi. Paraphrasing, Korin says this about the Ultra Divine Water, “This Water is most certainly Divine. Sacred Water is just Water with a kick, there is no magic in it. But Ultra Divine Water is packed with mystical properties and a magical zing. To enjoy it's benefits, you must first track it down. It is a perilous journey. Far to the north there is a treacherous maze of ice. To obtain it, you must first navigate this icy labyrinth, with many confusing paths to choose from, but only one exit. You can find yourself wondering aimlessly for weeks, years or until death. If you go, the one thing you must avoid, is darkness. You will fear it, it will be your greatest challenge. This darkness is blacker than night. It veils the Ultra Divine Water in illusions so cunning, you may never escape it's empty void once caught.” Thanks to Goku's mindset, built by his previous masters, the archetype of the Warrior Sage/Fool became the foundation of his ego when he choose to undertake this journey, to save the Earth from King Piccolo. Because of this, he is able to see through the illusions and finds the Water, which is held in a white container, with the writing in white and a red inner background. A note here, red is the color of the root chakra, (the first chakra, or Earth) and white is the 7th chakra, the crown. 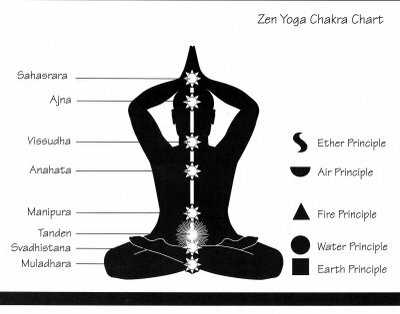 In other words, the first and last chakras that reside inside the human body. Darkness tells him, “It is very dangerous. One must be both mentally and physically strong to survive it, if unsuited, it means certain death. To make Goku stronger is uncertain. The Ultra Divine Water takes advantage of special powers within you. If you have no power, nothing will change. Only those with the special power will become stronger, the others will die. Thirteen have drank the water before, none survived.” After drinking the Ultra Divine Water, Goku's life runs in his mind, one event after the other, showing you his training, the Dragon (which is a symbol of the Tao) and his impending challenge (King Piccolo). Then his individual unconscious power flows forth into his consciousness. Keep in mind, not the awareness of it, he only tapped into some of the abilities which he unconsciously possesses, not all of them. Once he regains himself, he says “I feel different, but I can't explain it.” Goku says it's time, and Yajirobe is confused and says they doesn't know the way out. Goku however, responds with, “I do, it's so clear.” Goku can now sense things and his intuition has awakened. When speaking with Korin, Goku explains it like this, “I sense it. I feel it. I'm not what I was before. And it's not just the strength either. I feel power and at peace. With everything.” He can also now sense power levels, chi, ki, or the life force of others. So let's review: Because of Goku's head injury, his dna built ego of the STS Warrior was cleaned, becoming a “shadow self”, and replaced with a STO Warrior Sage/Fool archetype foundation by grandpa Gohan, Master Roshi and his choice to sacrifice himself, so that he might be able to help others. The Warrior Sage/Fool archetypes are both internal and external. Meaning they can switch rolls, so at one moment, on the outside he looks like a Fool, but he's really acting from the Warrior Sage archetype from within his own mind and vise-versa. He learns to control his breath, which is an internal alchemical process dealing with the tan tian, from Master Korin, learning the way of water and mercury. Later he makes his way through the labyrinth, because he was operating from his heart, or 4th chakra via air, and drinks the Ultra Divine Water (sulfur). This gives him momentary access to his individual unconscious mind (fire); allowing him to see how the Tao has operated in his life, how it operates in the world, allowing him to open up his senses to sense energy from others and he now has some conscious access to his intuition, because he knows his life Path. His life Path is that of the Warrior Sage/Fool who embodies Service To Others (unconditional love, acceptance and forgiveness both towards himself and others) and is willing to sacrifice his life for others. This process in the west is known as completing the Great Work; receiving the philosophers stone and the elixir of life. I am not completely sure as to the terminology used in the east, though I believe it to be similar. I do know that this process is studied and practiced in relation to Taoism, Yoga, Buddhism and nearly all eastern martial art's. I will mention here, that, in the Andean shamanic tradition of self-cultivation and healing the luminous body, what Goku did was access his 9th chakra for a split second; allowing this knowledge to rush in and because he was able to physically survive this process, his 8th chakra folded in on itself, upgrading (for lack of a better word) the 7 lower chakras within the body. In the west, this is known as the resurrection, death and rebirth or transformation process that Jesus under went, years prior to his physical death that is. This can also happen to people who have near death experiences. Of course, this is only the beginning of the self-cultivation process. As you know, Goku goes through a few different transformation processes, and his next master will be Mr. Popo, where he learns to refine his mind and abilities. Jesus did the same when he was tested by the Devil in the desert. It was just a different method of training. Korin tells Goku that he can not take the nimbus cloud any higher than Korin's temple, nor will technology get you up there. However, Goku's power pole will get him there. The power pole also represents the Tao, which Goku has had all along. By way of the Tao, is the only way one can reach the Temple Above the Clouds. Goku is given a bell, and told that only someone with that bell can meet Kami. You might think I'm stretching here, and maybe so, but bare with me. A bell causes noise, which is vibration and vibration is how energy operates, ie. Frequencies. Even matter is energy vibrating at a lower rate. Think of water, make it cold, the vibrations slow and it becomes ice, heat it up, the molecules speed up in vibration and it becomes steam. Same concept here, except with the life force within a human. In western science this energy field is known as the electromagnetic field. Therefor, the only one who can meet Kami, is one with a vibration high enough, which is attained via life experience, to rise above the clouds. Goku even passes a lightening storm on his way, which symbolizes high energy. 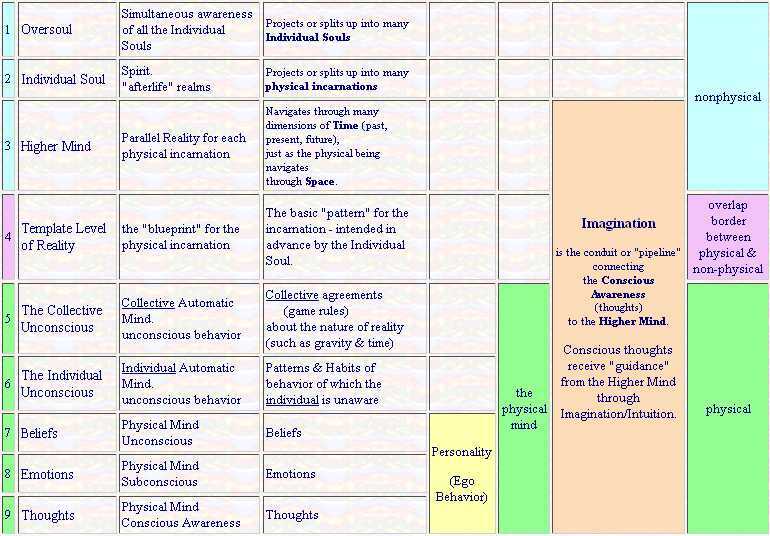 In keeping with our 9 levels of consciousness chart, Kami's lookout would be on the 5th level, the Collective Unconscious, because it is here Goku learns about the nature of reality. What exactly is it that Mr. Popo and the fisherman are trying to teach Goku? They are teaching him how to fully open his 3rd eye, or as it is known in science, the pineal gland. This is hard for anyone, but much harder for us in the west because of the fluoride in the water and toothpaste. Not to mention all the other chemicals which we ingest via our modern diets and the genetically modified foods which are being pushed upon us by Monsanto and the government. Now that we know the underlying idea of what Goku is learning, where does the weighted clothing come into play? Firstly, it builds physical strength, stamina and endurance. Secondly, it increases the amount of energy the body can build up and contain at a given moment. After a movement training session with this added weight, the built up energy moves via the path of lease resistance, this can clear out blockages within your meridian system (the energy pathways in the body) and if you combine this knowledge with meditation, this energy, or chi, can be used to nourish the spirit; and raise the spirit to a higher state of awareness, or consciousness, thus affecting the luminous body. This is also called internal alchemy. With this increase over a prolonged period of time, not only will the physical body adjust, but so to will the luminous body (energetic body) and because the luminous body operates outside of the physical, it will, in return, nourish, restore and “upgrade” the physical body to handle the additional stress. This includes, not only the bones, muscles, tendons, heart, lungs and other organs, but also the brain. This in turn will allow the use of more area's of the brain, which would increase abilities. Once this additional weight is removed, not only will the physical body feel lighter but the luminous body will be vibrating a much higher frequency, because of the training. This will, in theory, allow for greater abilities to be manifested in the physical reality. You can see this theory in action when Goku fights Piccolo at the world martial arts tournament. It is also during this fight, well, actually, after the fight is over, that you see Goku's spiritual cultivation has out grown that of Kami's. Kami realizes this and offers Goku his job as guardian of Earth. However, as we know, Goku flies off with Chi Chi to get married, following the Tao the entire way. For an interesting discourse, watch the episodes after the tournament, where they have to find the Magical Furnace and learn how Earth and Other World are connected. If you are familiar with the I Ching, or Inca mythologies, you'll see many interesting connections. 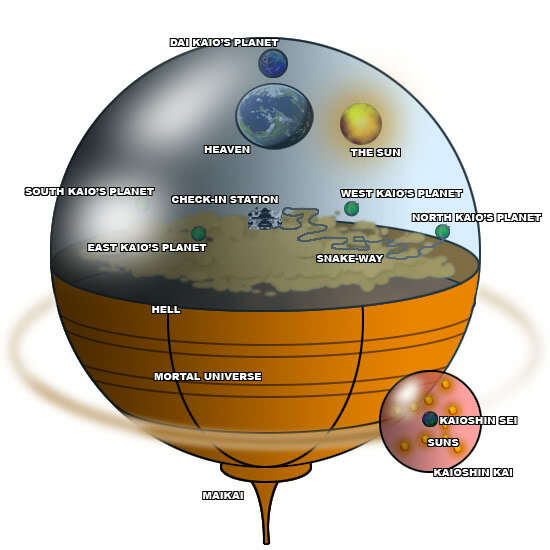 Why is snake way and King Kai's planet located in the 4th level of consciousness, aka. The template level of reality? Well, it is here that time moves much slower than it does on Earth, because this realm is partially physical and partially non-physical, or energetic, operating at a higher frequency than the more dense environment of Earth. This is also why the gravity on King Kai's planet is 10x that of Earth. The higher the spiritual cultivation of the beings living on the planet, the higher the planet's gravity. For example, if the gravity at the check-in station was 10x that of Earth's, then King Yimma would not be as big, he would be a similar size to King Kai. Then why is Goku not crushed by the 10x gravity? His luminous body supports his physical body. At least this is the theory. It should also be mentioned here that Goku must endure snake way, meaning traveling along a narrow path for who know's how long, before finally arriving at King Kai's planet. Later, when Piccolo and the others travel there, King Kai remarks, they made it there faster than Goku. Why is this? Maybe because when there are two or more people, helping and supporting each other, that their energies amplify each other, causing an accelerated growth in development. King Kai is an interesting character, and one of my favorites. His goofiness might be annoying to some, but I find it up lifting, which is actually the point of his personality. You see, laughter causes a feeling of joy, which is a Way of speaking to the spirit. It is the same as the feeling of excitement and love, you can feel the energy within you, when experiencing these emotions and they “raise you up”. This is why, to train with King Kai, he requires that you make him laugh. After this you are ready to begin the training. Stages one and two, catch Bubbles and hit Gregory seem to have one goal; to make you stronger. While this is partially true, the flip side, is that it also raises the awareness and connection to, your body and environment. As your physical and luminous bodies adjust to the added stress of the environment, it becomes second nature, and the mind and spirit are freed for further learning. The Spirit Bomb gathers energy from all living beings, from 1st density (elements/planets), 2nd density (plants/animals), 3rd density (humans) and even higher density beings like stars. This energy is not the user's, but is from outside his own energetic field, the user is only controlling this energy. It must be pointed out though, that the user must request or ask to use this energy from the beings, one can not just take it. We can see by the techniques learned from King Kai, that they operate on both the physical and non-physical reality at the same time. The need to understand the blueprint of a being's structure is also required for this techniques, which is another function of this level of consciousness. It is here that Goku also learns how to channel the energy produced by anger, in a calm productive manner to enhance his training. This comes in handy later while fighting Frieza. Step four: Empty space, 100x Earth's gravity and accidental forced raising of the spirit. Goku's training in the space ship, surrounded by empty space, in 100x gravity is taking King Kai's training to the next level. Goku had come to understand the affects of training in higher gravity, but the unintended consequences of being stuck upside down in such high gravity would come out of nowhere. You see, when you hang upside down, the blood and chi will follow the path of least resistance. Which, in this case, because of gravity, is straight to the brain and the upper chakras. Being stuck upside down in 100x gravity multiplies this exponentially. This opened up abilities in Goku that he just started to understand when landing on Planet Namek; reading minds and being able to see all beings on the planet at once, for example. The first transformation: Up until this point Goku has relied on a clam mind and spirit as his path for power and self-cultivation. After accepting Vegeta's dying request, seeing his best friend killed and being completely out of energy, Goku's anger turned to rage as he was out of options, and he transformed into a Super Saiyan. As Goku would later come to explain the process to Gohan, it came from a need, not a desire. As Vegeta would later explain it, he had to let go of everything, and in a since, open up to allow the energy to flow into him. This is similar to what Popo was teaching, except this time, it is an inflow of energy from a different chakra, instead of awareness coming into the 3rd eye chakra. Where did this energy come from? I believe this was a Kundalini awakening. Yes, you heard that right. One of many... More on this shortly. From here we begin to walk the boundary of self-cultivation and demonic control at the same time. The connections pointed to from here on out, and how they relate to our present reality, some might say is crossing the line. My response is, open your eyes my dear friends, for truth is always stranger than fiction. Bibidi, the wizard or occult magic user, who uses magic and has no heart what so ever, akin to a psychopath in our modern terms. We have these types of people on Earth as well. They hide in secret societies, the Illuminati for example, and have been present since ancient times, causing wars and chaos, in an attempt to control the human population. Now you know Buu, he is basically an incredibly strong and aware being, with the mind of a child, but all he knows is destruction, and cares not for others because he has never been shown that was a possible Path. That is, until he met Goku and upon his defeat, Goku requested that he choose to be reborn on Earth, as a “good” person, for a rematch. The arrival of Uub. The young boy raised in a loving community, shy with little confidence and unknown to himself, his own true potential. After Goku used anger to draw out Uub's power, by making fun of his family, Uub starts to see his potential. Goku then trains him, as his replacement, to protect Earth and her people from those who wish to destroy it. The moment this task is completed, Goku is transformed into Son Goku once again, by the power of the Black Star Dragon Balls, or the Tao. A highly cultivated spiritual being, now in the body of a child; Son Goku now repeats the same process he had under took before, collecting the dragon balls, except the scale is much larger. Going from planet to planet, helping all those he came in contact with along the way. This is only a theory on how the Super Saiyan levels draw their power, so take it with a grain of salt. In Super Saiyan 1, the need comes from different stimuli for each person. For Goku it came from loss, which is felt via compassion in the 4th chakra (heart). For Vegeta, it was letting go of his image of self, which is from the 2nd chakra. For Gohan, it came from a life or death situation, or the 1st chakra. So, with this we see that SS1 comes on by different methods for different people, depending on where they are in their self-cultivation. With SS2, Gohan got there first, after getting his body, mind and spirit accustomed to the SS1 state. His SS2 transformation took place from knowing he had the ability, thus it came forth from the 3rd chakra because it was Goku's faith in him that allowed the transformation. Gohan had trouble controlling himself in this state, and it was only with Goku's help from the Other World, that allowed Gohan to manifest the power to defeat Cell. Into SS3, Goku describes this as going deep down, way deep down to find the power. This seems to point to the fact that you must know the power is there within yourself. Here we are now at Super Saiyan 4. SS4 seems to be a little different than the others. Firstly, to transform naturally, you must have a tail, be aware and capable of transforming into a SS3. 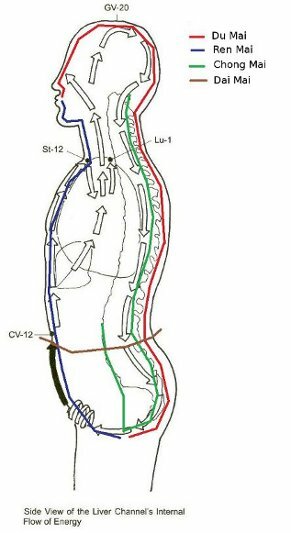 I believe this tail is referring to the Chong Mai pathway within the body, and dna activation. In addition to this pathway being fully open, it might be possible that the tail also points to the Dai Mai pathway, as it is used for pivoting and is interconnected to all the other main pathways for energy exchange and balance. The above photo shows how the 7 chakra's within the physical body connect to the 8th chakra inside the luminous body and the 9th chakra just outside the luminous body, and the physical representations of these chakras as they are manifested in the physical world. 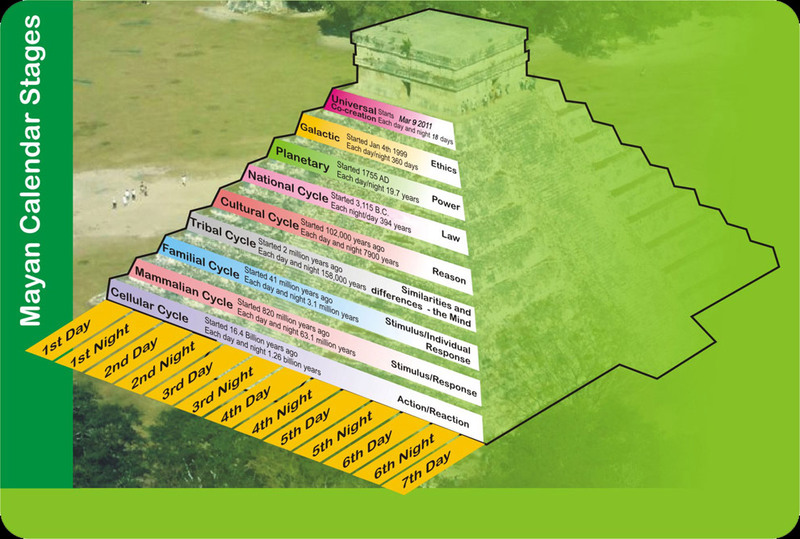 It also shows what the Mayan called the Galactic Alignment that took place on December 21, 2012, what Jesus referred to as the Dawn of the Son of Man, which is symbolized by the Cross upon which he was crucified, and what many other cultures talk about in their prophecies of the “end times”, or transformation period of humanity. Channeled sources have referred to this as the splitting of the Earth, or dividing of the Earth, or the birthing of a new Earth. This is symbolized in DBGT by the Earth (STO) and the Truffle Planet (STS). Like the dividing of an embryonic cell. How did I come to this idea? Firstly, this takes place in GT, or Generation Transformation. In GT the events, the level of severity of events, happen faster and faster, one after the other and more intense with each event. The same as how the Mayan and the Bible both depict the time during the “end of days”. You can see this happen now, all around you. Also, in GT, it is not the Golden Star Dragon Balls that are being used, it is the Black Star Dragon Balls; ancient balls that had long been forgotten. Remember, in Dragon Ball, there is meaning in everything. The Golden Star balls represent the source power of the Dragon as coming from the STO Source (yang). We can see this by the color of the stars. On the other hand, the Black Star Balls show the energy source coming from the complete opposite end of the energetic spectrum, or the STS Source (yin). It is from this source that Goku was transformed in to Son Goku; akin to the Enlightened Being, being portrayed as a child. I have come to the conclusion that the SS4 transformation could only happen during, or after this alignment. Because the 4th density energy is now flowing into the Milky Way system, into the Earth and in turn affecting the humans. When Goku transforms into the Golden Ape, the energy is still a primal energy source, meaning it has the ability to be used for STS, or STO, depending on the vessel's choice. Here, Goku is the vessel because the energy is flowing into him via Kundalini/Earth connection. We see at first he looses himself in this power, and can not consciously control it, making him destructive. It is only after he remembers who he is, that he is able to gain control of the power within his body, and transform into the humanoid forum which embodies STO. This IS THE Warrior Sage archetype, fully realized. This can be seen in the colors which are displayed in this new form. Goku's body hair is red, showing he is completely rooted in the Earth, his chest to head are human skin (4th-7th chakras) which shows that this is the human part of him, with black hair showing he is fully embodying the Yin, or primal energy, wearing orange pants showing his 2nd chakra at work and he is outlined in a blue belt, shoes and wrist bands, showing this is how he displays himself to the world. The truth is, some of these connections might be stretching it a bit, but the level of energy and awareness at a level such as this is currently, unfathomable. It is this section that is most important. In the previous section I have alluded to the fact that we, the people living on Earth are currently in the “end times” as foretold by the Maya, Jesus, the Inka, the Hopi and many other prophetic cultures. This is not a time for fear, it is a time to rejoice; a time to embrace all aspects of yourself and others, in unconditional love, compassion, acceptance and forgiveness of any perceived wrong doings. We all came here to learn certain lessons. It is time we slow down, step away from the social paradigm forced upon us by governments and the media, question why we do the things we do, why the world is the way it is. Let go of relationships, beliefs, thoughts and emotions that do not service the higher aspects of Service To Others. This is the most difficult thing to do. Our ego will do everything it can to hold on to what it thinks is the self, but this is a weak, lower self, not your True Self. With much love and endurance, your ego will come to see the Reality. There are STS beings that are doing their best to keep us from this. Similar to the Truffle virus, but on the energetic plain. Call them demons or any other name cultures have labeled these beings. The point is, these thoughts are not your own. Truffle = “the fruit people”, fruit is highly acidic. Not good for internal energy work. Saiyan = “the vegetable people”, green veggies are highly alkaline. Great for internal energy work. The point of this document is simply to get you thinking outside of the box. Follow your Heart, and you will find your Way. You are not alone, there are many people and Beings who are assisting each of us along our Path of unfoldment. Just like Goku on his Path. If you keep an open heart and mind, always choosing to see the good in each person and situation; help will always be there when you need it and least expect it. Turn off the tv! Only watch those things which speak to your soul, or spirit. All those other shows, films, commercials and news channels, serve only to cloud and confuse the mind. Do not eat GMO food if you can help it. Do not eat processed food! Eat only high alkaline food/liquids! Try cultivating a new mental attitude centered in Service To Others, towards the world and those around you, and reinforce this new foundation each moment of the day. If you catch yourself reverting to your old behavioral patters, stay calm, notice what happen, forgive yourself and let it go. Continue on with your practice. Spend time in nature. The city environment is destructive to your energetic bodies. As non-fun as it might sound, do not over use your sexual organs. Get you a Theta meditation audio cd, listen to it with headphones when doing work around the house, at work if possible, while reading or pretty much anywhere you can. The Theta brainwave state helps to calm the mind, clear emotional blockages and rebuild a new mental foundation. The above are just the tip of the iceberg! Happy seeking my friends! Posted on February 3, 2013 by Siris King.